← Free Joomla Templates to Knock You Out! One more attractive and useful freebie is waiting for your approval! Today we are eager to represent a Free Joomla Interior Theme which you are welcome to download and turn into a successful project which will be able to realize your creative ideas and plans. Original design and eye-catching color scheme based on two contrast tones – black and red will immediately make your project a special one, easily recognized and remembered. 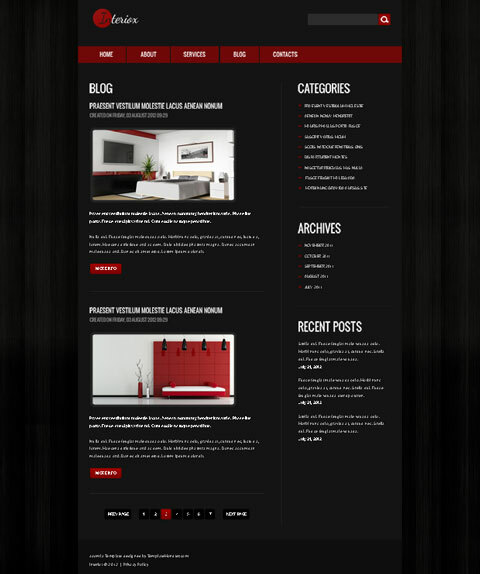 This theme consists of several pages including Home, About, Services, Blog, Contacts. Do you want to impress your potential clients? Then you have found the quickest and the easiest way to do it! This free website template will give you a perfect chance to jump-start your project right away! Just download the whole package of this Free Joomla Interior Theme visiting the download page at TemplateMonster, type your email address (don’t forget to uncheck the newsletter subscription checkbox in case you’re already subscribed, otherwise you may not be able to download the zip file). Success is closer than ever. This entry was posted in Free Joomla Templates. Bookmark the permalink.